The National Coastal Tourism Academy (NCTA) was established in 2013 with funding from the Coastal Communities Fund to create a centre for excellence, share best practice and analyse the nature of coastal tourism to boost jobs and economic growth in the visitor economy. The NCTA now has an in-depth knowledge of the visitor economy on the coast and have available to review a number of very interesting and insightful research reports presented in their ‘resource hub’ that identify growing business potential for coastal businesses. 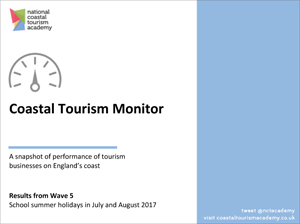 A snapshot of performance of tourism businesses on England’s coast.